Kiwifruit (the fruit of Actinidia Deliciosa) is one of the most tasty and delicious foods which are extremely useful for our health and can work for our benefit as natural remedies. 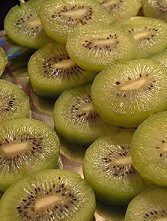 It is commonly believed that Kiwifruit originates from New Zealand, where it received its name after famous Kiwi birds, an international symbol of New Zealand. However, this fruit is native to northern China (namely, the Yangtze River valley), where is it known as Mihou Tao, or”macaque peach”. This fruit was brought to New Zealand by Chinese missionaries in the beginning of the last century. Nowadays, Kiwifruit is popular in many countries of the world, and the largest plantations of Kiwi trees are located in California, New Zealand, Chile, Italy, Greece, Japan, France, South Africa and other places. Kiwifruit is a special delicious gift from our Mother Nature. Both adults and children love eating it since it has miraculous properties and beautiful taste. Its brown hairy peels make Kiwis look like little hedgehogs. The bright emerald green flash, soft white pulp and exotic sourish taste of this fruit makes it an ideal material for tropical cocktails and fruit salads. Finally, small black crunchy seeds of Kiwifruit are used for producing Kiwifruit Oil, which contains Alfa-Linoleic Acid, an essential Omega 3 fatty acid. Sweet and juicy Kiwifruits contain more Vitamin C than the same amount of oranges, the same amount of potassium as bananas, as well as a lot of other natural nutrients and vitamins. Every fruit has 40-50 calories. Recent researches showed that Kiwifruit has a unique property to protect our DNA from mutations and destructive effects of oxidants. This fruit contains various types of flavonoids and carotenoids, as well as the mentioned beta-carotene. In addition, Kiwifruit can be a perfect source of Vitamin E, in important antioxidant, which can provide free-radical protection for our body. Kiwifruit can be an essential food for elder people since it can prevent the development of so called age-related macular degeneration. Therefore, eating Kiwifruit can prevent vision loss and promote overall health in elder people. Kiwifruit contains useful natural dietary fiber which assists in keeping good cholesterol and sugar levels in our blood. Besides, it stimulates detoxification processes in our body and can help to prevent colon cancer. The studies proved that eating Kiwifruit on a regular basis improves our cardiovascular system, prevent formation of clots and lowers the amounts of fat in our blood. Scientific evidence was found for anti-inflammatory effects of this magic fruit. Finally, this superfood contains magnesium, calcium, iron, copper and phosphorus, which can relieve the symptoms of asthma, as well as prevent coughing and wheezing in children. Well, talking about all useful properties of Kiwifruit will, probably, take much more time and place. I just recommend you eating Kiwifruit every day, and you will always be healthy, good-looking, active and young. You can try preparing my favorite fruit salad: mix pieces of kiwi, bananas, pineapple (you can use canned pineapple) and strawberries, and dress the salad with some cream or yogurt. Also, Kiwifruit can be used for tarts and other backery. Some experts recommend serving with Kiwifruit such dishes as …. fish. Hmmm, I have never tried. Those who like eating Kiwi should remember that this delicious fruit contains actinidin, so certain allergic reactions are possible. Take care about your health and pay attention on what you eat!